Tell me, which do you prefer? Reading an email from a colleague in English or talking on the phone with them? Relaxing in the evening with a book in English or a film without subtitles? Reading a blog post or listening to a podcast? If you learned English by reading and writing, rather than speaking or listening, I can understand that you feel more comfortable reading. And if you’re a fan of literature, it makes sense that you prefer reading to listening. But if you want to better understand spoken English. So you can chat to native speakers or watch films or TV series more easily, you’ll need to put down that book and start listening. The good news is, you don’t need to choose between reading and listening. You can combine your love of literature with your goal to better understand spoken English. In today’s episode, you’ll discover 4 ways to read and listen at the same time. You can also download a free sample chapter of an audiobook I’m working on for reading fans: a blogcast (more on that in the episode) of last week’s blog post. As promised, here you’ll find all the links to the resources I mentioned in the podcast. You can read along as you listen. This will help you to link the written word with its spoken form. You don’t necessarily need to sign up to a paid subscription like Audible because many audiobooks are free. Otherwise, Penguin Books, a publishing house, uploads extracts from their audiobooks onto Soundcloud. Bookriot has compiled 11 websites where you can find free audiobooks. Digitaltrends have made a list of 15 websites where you can get free audiobooks. Plus you can watch the video above the article for some extra listening practice. Blinklist is an interesting app I’ve started using recently. It allows you to listen to summaries of non-fiction books. You can get started with a trial and the free version of the app. The options are a bit limited in the free version though. If you need help choosing an audiobook, my colleague Luciana has a set of questions you can ask yourself to help you pick one. The BBC has several shows across its different radio stations all about books. The US-based National Public Radio also offers different programmes on literary themes such as interviews with authors, book reviews, recommendations, and people talking about their favourite books. Poetry Out Live Listen to famous actors and authors read poems aloud. You can find the written version of the poem on the site and open it in a new window to read as you listen. You could also trying doing a dictation exercise this way – listen to a line of the poem, write it out and compare with the original. The Poetry Archive Poets recite their own poems with a short introduction and a reading. When you click on a poem, you are taken to a page with the text of the poem below. The disadvantage is you need to pay to download the poems. The poems are read faster than on the ‘Poetry Out Loud’ site. British Council Learn English: Stories and Poems Listen to and read stories and poems created for English learners. They come with downloadable exercises. Update: thanks to Conversations with Kate, I’ve discovered a new poetry resource, The Poetry Radio Project. A blogcast is a new word that’s a mixture of “blog” and “podcast”. In a blogcast, writers of blog articles read aloud their blog post. 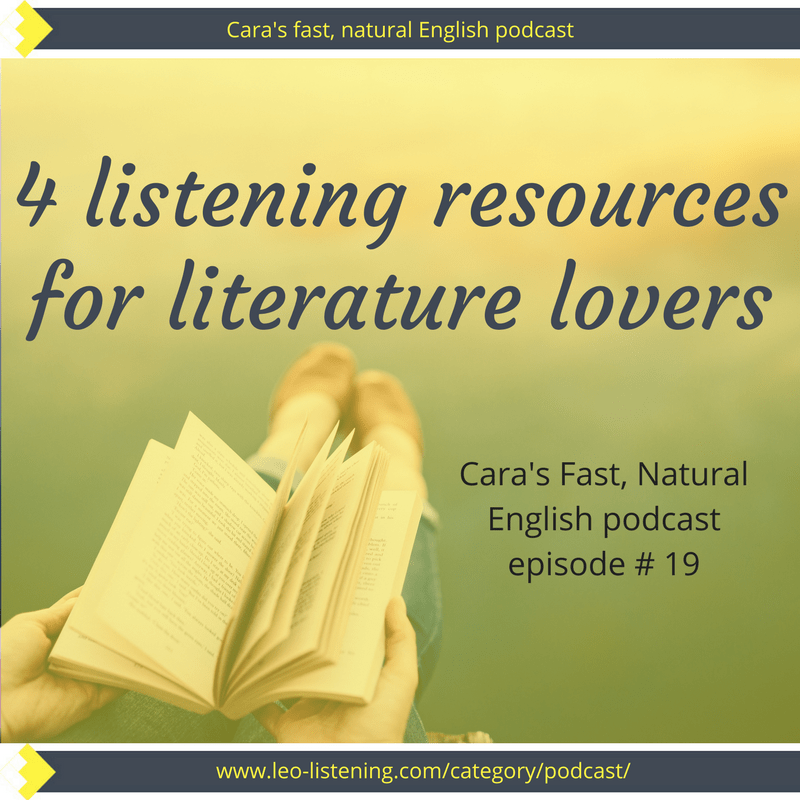 No excuses literature lovers – there are plenty of resources you can listen to that’ll satisfy your book-loving needs. Let me know in the comments – have you tried any of these resources? Did they work for you? Have you got any more resources to share with the Leo Listening Community?